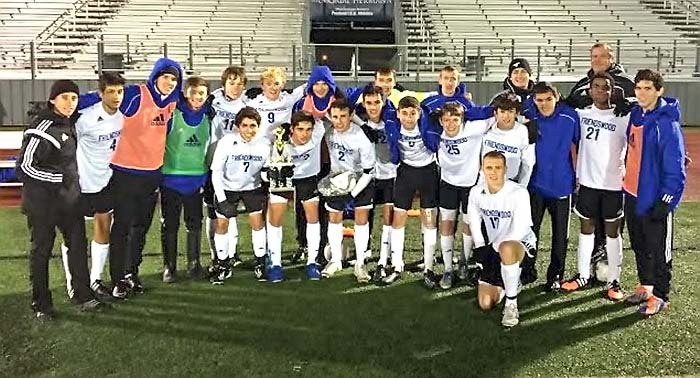 FRIENDSWOOD — The Friendswood boys soccer team won the Pasadena-Pearland-Friendswood soccer tournament with a 2-1 victory over Pearland Dawson. In doing so, it also claimed the 400th win in the school's 25-year program history. "We were on 399 entering the finals of the tournament," said Friendswood head coach Stephen Peter. "I didn't tell the kids before the game, but did after we won. They were kind of fired up about it." Friendswood began their soccer program in the 1990-1991 school year. They have 16 district championships, 22 playoff appearances, six regional tournament appearances, three regional final appearances and one regional championship (2012). 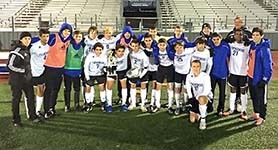 Coach Peter has been at the helm for 23 of the 25 years and has done a tremendous job in establishing Friendswood as one of the premier teams in the Houston area. The Mustangs beat Pasadena (3-0), Fort Bend Dulles (1-0), and La Porte (3-0) on their way to claiming the tournament championship. Friendswood is currently 6-1-1 on the season.